We supply all the gear as above, plus logistical support - transport from your doorstep to the start of the trail, bag transfers each day, food and beverage transfers, and a shuttle back home at the finish. Too easy! We supply all the gear and logistical support you need as above, along with organising great accommodation with self-catering facilities in relaxed rural settings. Just BYO food (we'll transfer this for you each day), and you're away! We organise everything so that you can just turn up and ride. All the gear, logistical support, food, accommodation, information and safety support you could ask for. Just get to Wellington and we'll take care of the rest! As above, but with a vehicle and host dedicated exclusively to your group. Think strategic tea/coffee stops along the way, van-rides if tired, regular first-aid/mechanical/information support, and your own personal chef. Treat yourself! 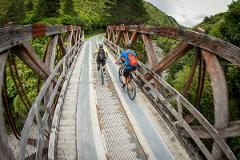 Cycle the entire Remutaka Cycle Trail, with an afternoon and night in Martinborough. A great way to sample the best of Martinborough while completing the Remutaka trail in a shortish timeframe. Fully supported. 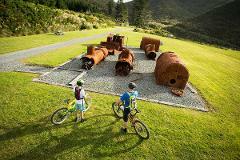 Explore the Remutaka Cycle Trail, Cape Palliser, and Lake Ferry. An extended itinerary for those wanting to skip the bright lights of Martinborough and see the quiet corners of the countryside, taking in some of our favourite spots.